Powerful Category 4 Hurricane Michael is set to make landfall today. 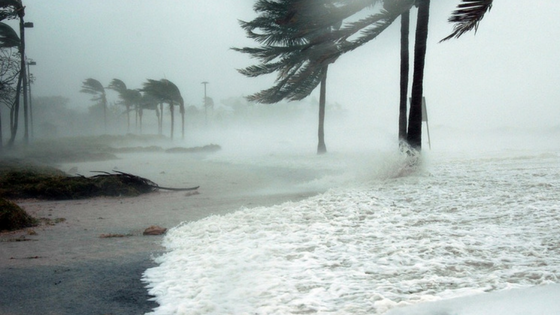 Overnight, the Category 2 stormed rapidly intensified to a Category 4 hurricane. The Florida Panhandle will experience storm surge, hurricane-force winds, and flooding. Keep reading for the latest updates on Category 4 Hurricane Michael or join our Facebook Live update today at 12 p.m. EDT. As of 7 a.m. CDT, Michael had maximum sustained winds of 145 mph. These wind speeds make it a strong Category 4 hurricane on the Saffir-Simpson wind scale. At this time, Michael was located near 29.0 N and 86.3 S. This is about 90 miles southwest of Panama City, Florida. It is also about 90 miles west-southwest of Apalachicola, Florida. Michael is moving north as 13 mph with a minimum central pressure of 925 mb. This is also 27.55 inches of mercury. 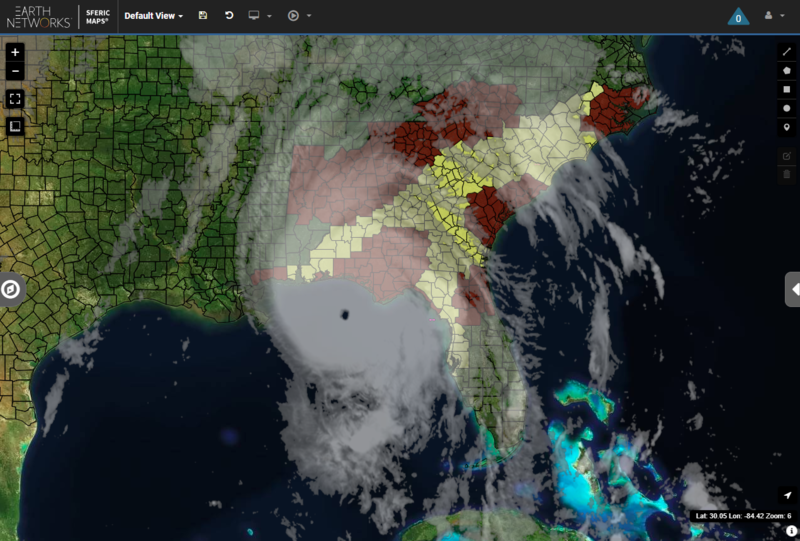 Hurricane Warnings are in effect from the Alabama-Florida border to Suwannee River, Florida. Tropical Storm Warnings are in effect from the Alabama-Florida border to the Mississippi-Alabama border. They are also active from Suwannee River, Florida to Chassahowitzka, Florida. Finally, you can find active Tropical Storm Warnings from Fernandina Beach, Florida through Surf City, North Carolina. There is also a severe thunderstorm threat within Category 4 Hurricane Michael’s bands of heavy rain. A Tornado Watch is in effect across the central and eastern Florida Panhandle and southwestern Georgia. 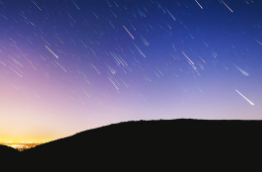 This includes Panama City and Tallahassee, Florida as well as Albany, Georgia. 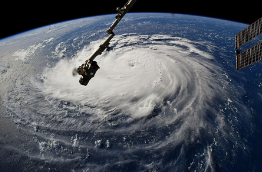 According to some research by Earth Networks Postdoctoral Researcher, Jeff Lapierre, hurricane intensification happens 12-20 hours from a burst in eyewall lightning occurrence. Yesterday, our total lightning network caught a burst of eyewall lightning between 3:30-4:30 p.m. EDT. Jeff’s research was spot on. 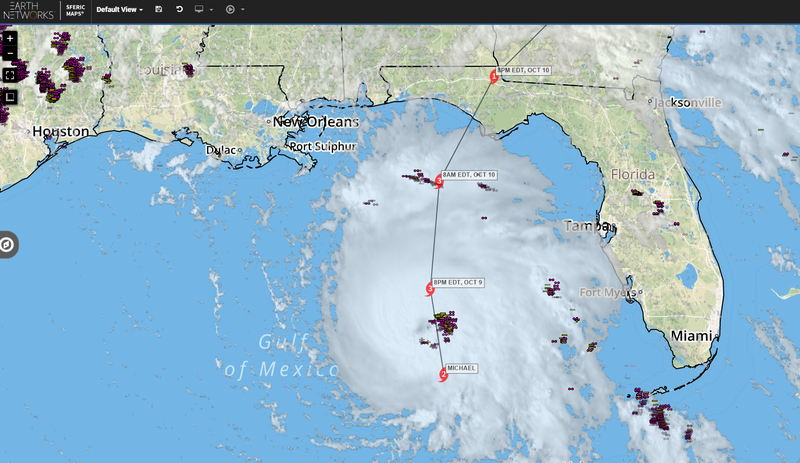 Hurricane Michael intensified into a Category 4 storm earlier this morning. 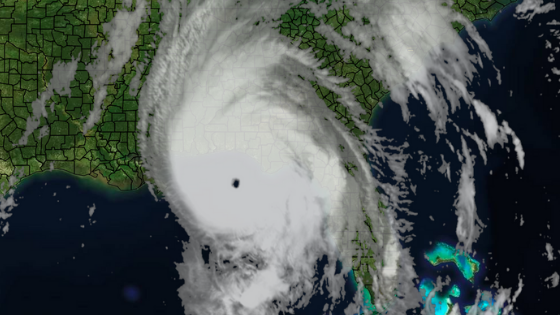 To put it in another perspective, at 8 p.m. EDT last night, Michael’s eye was 24 NM diameter and its pressure was 954 mb. As of 6 a.m. EDT this morning, there was still significant lightning in Michael’s eyewall. The eye shrunk to 16 NM in diameter. Michael’s pressure also dropped significantly to 938 mb. This drop in pressure indicates an extremely strong storm. 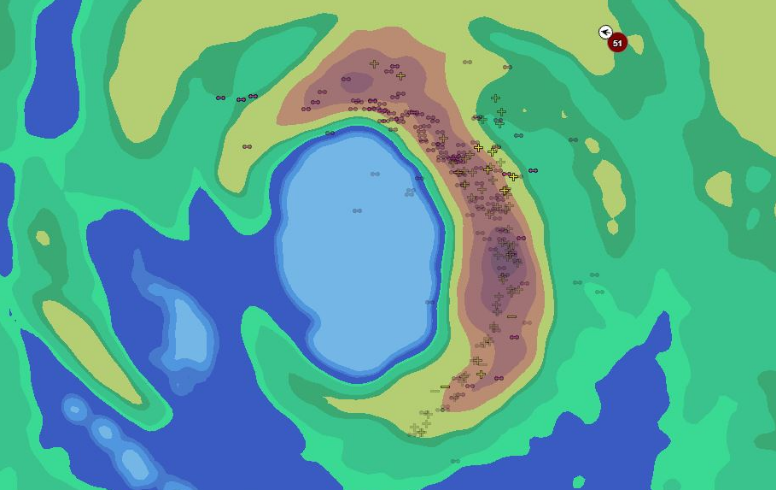 Earth Networks Meteorologist, Anthony Sagliani, captured this image of radar and lightning data on our weather visualization tool, Sferic Maps. This is just one of the many ways our total lightning network allows us to provide the fastest severe weather warnings. The better you understand lightning, the better weather-related decisions your can make for your organization. You can get a free trial of Sferic Maps and access our world-class global total lightning network for free right now. Just click the link below. Hurricane Michael is likely near its peak intensity as it traverses very warm water and a favorable upper-level environment ahead of it. 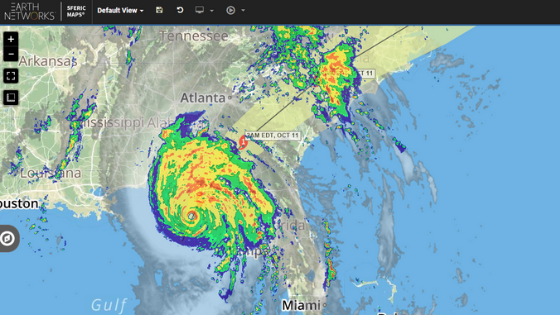 Michael is on track to make landfall across the Florida Panhandle this afternoon. After landfall, Michael will stay an extremely powerful storm that may produce destructive winds. As Michael approaches the U.S., the strongest winds and greatest storm surge will occur east of the eye of the storm. Storm surge will be between 8 and 12 feet possible across Florida’s Big bend area of the Gulf Coast. Heavy rain will produce localized flooding. We expect the majority of this flooding to occur across the eastern Gulf Coast, northern Florida, and through the Southeast U.S. during the midweek. After Michael makes landfall, it will accelerate east-northeastward into the Carolinas on Thursday. It should barely scrape New England on Friday. The one saving grace with this storm is that it will keep up its speed the entire time it’s over land. 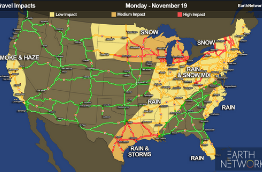 Heavy rain producing localized flooding is likely across the saturated Carolinas that were affected by Hurricane Florence just a few weeks ago. Localized flooding is also likely across the Delmarva Peninsula later this week. Further in the central Atlantic, Tropical Storm Nadine is churning to the north-northwest at 7 mph. As of 5 a.m. AST/EDT, Nadine was located at 12.1 N and 31.1 W. This is about 485 west-southwest of the southernmost Cabo Verde Islands. Nadine has maximum sustained winds of 50 mph. The minimum central pressure was at 999 millibars. This is about 29.50 inches of mercury. Nadine is forecast to weaken to a tropical depression by the end of the week as it remains over the open Atlantic. 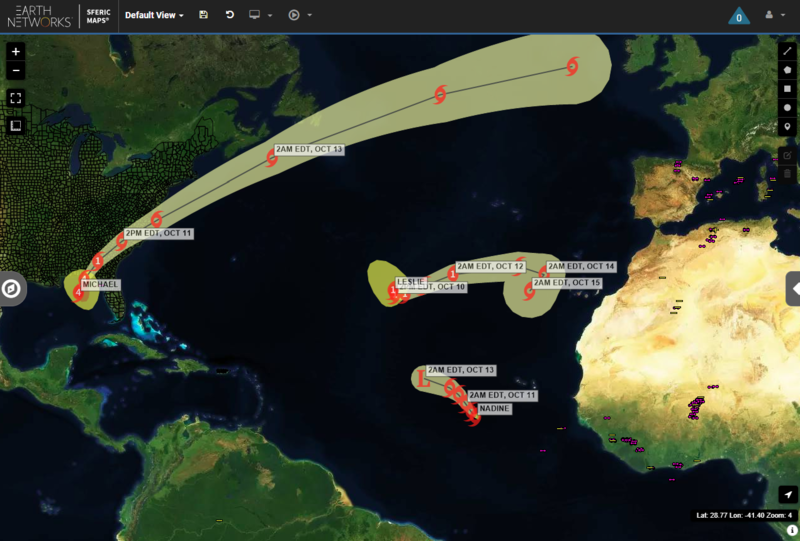 Meanwhile, Hurricane Leslie lingers across the open Atlantic affecting shipping lanes. As of 5 a.m. AST/EDT, Leslie was located near 28.6 N and 42.6 W. This is about 1,105 miles west-southwest of the Azores. Leslie is currently packing sustained winds of 75 mph. It’s moving south at 10 mph. The minimum central pressure is 981 mb, or 28.97 inches of mercury. Leslie will continue to move about the open Atlantic over the next several days.